the number of poles in the motor winding. Note - an induction motor will never reach its synchronous speed. If it did - the rotor would appear to be stationary to the rotating stator field since it would rotate with the same speed. With no relative motion between stator and rotor field no voltage will be induced in the motor. The speed of an induction motor is therefore limited to a speed below synchronous speed and the difference between synchronous speed and actual speed is called slip. A variable frequency drive modulates the speed of an electrical motor by changing the frequency of the power supply. Engineering ToolBox, (2004). 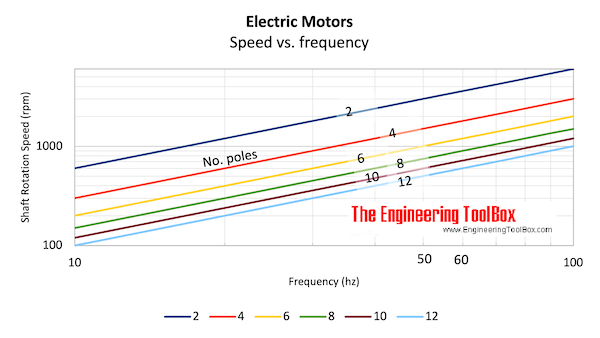 Electrical Induction Motors - Synchronous Speed . [online] Available at: https://www.engineeringtoolbox.com/synchronous-motor-frequency-speed-d_649.html [Accessed Day Mo. Year].